been stabbed? the nearest A&E will only be a few hours away. Organised by Wigan Trades Council, supported Wigan & Leigh Save Our NHS/Keep Our NHS Public – Saturday 10th November – Wigan Town Hall 11.00 – 13.00 (See Foyer Noticeboard for Room Details)The future of one or more of Greater Manchester’s A&E Units which includes Wigan’s Bolton’s & Trafford’s, is under threat under the ‘Healthier Tougher’ review of how NHS healthcare services are delivered. In what even a Tory paper such as the ‘Mail on Sunday’ has said will result in ‘Beeching-style’ closures of major casualty units, this review is likely to leave millions with huge journeys for emergency care, including hundred of thousands in the Greater Manchester area.. The Government claim the switch to bigger and fewer A&Es will improve patient care by focusing emergency treatment in high-tech ‘centres of excellence’. Opponents argue that the real purpose of the ‘slash and burn’ approach – as it was described by one London hospital consultant – is to save money. The NHS must cut £20billion from its budget by 2015. These cuts are to take place despite promises by the Conservatives in their General election manifesto to increase spending on the NHS in real terms year on year. Pro-defence of the NHS Campaigners in the Wigan, Bolton & Trafford areas believe the best way to fight the threat to all Greater Manchester’s A&E units, which the consultation over is scheduled to start in spring next year, is to unite together across Greater Manchester to demand no closures of any of the conurbation’s existing A&E units and to oppose all cuts in any other NHS services. If we are unsuccessful in that fight, then it is inevitable that the axe will fall where there is the least resistance. This meeting will hopefully help kick start the next phase in the fight in the Wigan area and to make sure the we are not that weak spot. Please attend the meeting and get involved with the Wigan & Leigh Save our NHS/Keep Our NHS Public and wider Greater Manchester campaign to save ALL our A&Es and OUR NHS!. If you can help with advertising the meeting in any way, then please do, including by sharing this event on facebook and forwarding this e-mail to your own contacts. Wigan & Leigh Save Our NHS Campaigners will also be joining Wigan Trades Council members at 11.30am on Saturday 3rd November outside the Grand Arcade on Standishgate and helping to hand out leaflets to advertise this meeting and collect names for our new Greater Manchester petition. BEIJING – The mother of China’s prime minister was a schoolteacher in northern China. His father was ordered to tend pigs in one of Mao’s political campaigns. And during childhood, “my family was extremely poor,” the prime minister, Wen Jiabao, said in a speech last year. Many relatives of Wen Jiabao, including his son, daughter, younger brother and brother-in-law, have become extraordinarily wealthy during his leadership, an investigation by The New York Times shows. A review of corporate and regulatory records indicates that the prime minister’s relatives – some of whom, including his wife, have a knack for aggressive deal making – have controlled assets worth at least $2.7 billion. @Daily_Express A charge of murder will lie on file as a detective did not follow arrest guidelines. It is impossible to frame laws to cover every contingency, which is why they are full of “subclause, paragraph (i(a)),subsection (4 (iv (c)))” nonsense. It’s also why the rich and powerful escape paying the intended level of tax. It is the reason why Judges are meant to be men of wisdom. They are there to interpret the laws and see that they enforced in intent. They are paid huge salaries and afforded great legal protection and respect (the Contempt of Court charge is the nearest we have to a law which is intended to be without appeal), so that they provide good decisions, which are meant to reflect the intentions of Parliament. In a sense, tax collector’s are accorded similar status with power’s to almost arbitrarily destroy the lives of person’s and the activities of organisations. Why, then, do we so often hear of judges claiming that they are constrained to release guilty men, on a technicality? Judges and taxmen seem to be claiming that, although they know that a law was intended to be applied in a particular way, they must follow the instructions, as written, or as interpreted by a predecessor. If such is the case then we do not need them. We can employ the lowest grade of Civil Service clerical officer, with minimum guidance from their seniors, to execute such judgements. “he wasn’t read his rights, even though he admitted murdering the victim and led the police to the body, he must be freed” does not require a Solomon, it only requires an idiot with a rubber stamp, paid minimum wage. “A charge of murdering Becky Godden, 28, will lie on file as a detective did not follow arrest guidelines”. Last night was sorted until we came to rely on Privately run utilities. My wife had gone to meet up with my daughter to see The Mousetrap In Manchester and I’d gone into Liverpool. Before setting off from my friend’s, I texted my wife that I was on my way. I didn’t get a reply, so I pulled into a lay-by on the East Lancs to say where I was and got a reply that she was heading for the train. 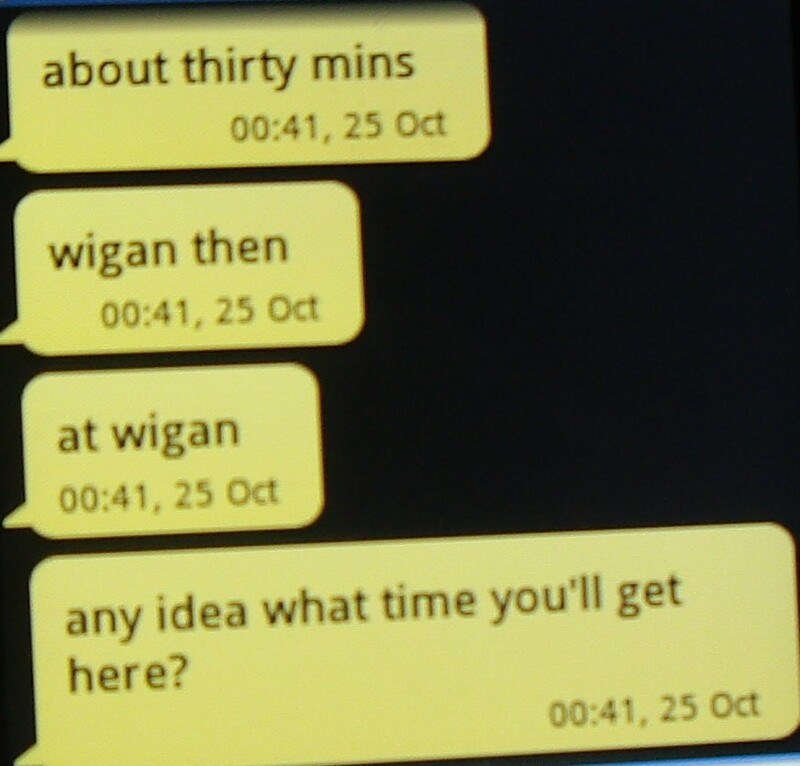 I headed for Wigan station and texted my arrival. After 30 mins sitting in Wigan, I got a garbled call from wife that she’s going to Bolton and my daughter’s boyfriend will be picking them up. I headed home, as my wife suggested. Following day (after wife gets home from work), the story unfolds. The line from Manchester to Wigan closed at 8:00 p.m. for maintenance work. There had been no information for those travelling to Manchester and none for those waiting for pick-ups at Wigan. Whose fault Network Rail, or Northern Rail? Other’s were in more serious situations. As an example, one young girl was in tears on how she was to get to Liverpool. There were other (too many) similar stories. Meanwhile my wife had had problems contacting me. She got my 3 of my 4 texts the following day (see pic.) and had great difficulty reaching me, herself. My wife’s contract is with BT and mine is with Vodaphone. At least when we had the “inefficient” nationalised services, there was only Britsh Rail, British Telecom etc.to take the complaint’s and they were answerable to your MP (now they just shrug off responsibility). My wife and daughter were put in danger, by two services that take our money for those services and then dismiss our concerns with an attitude reminiscent of Andrew Mitchell. Just one more point: The Green’s and The official Labour party are trying to get us out of our car’s and onto public transport: A pity that young girl had to. important texts all passed on at at same time…useless. There needs to be a safety net for traveller’s who get stuck far from home by inadequate privatised services and a lack of public transport. @Daily_Express Is the establishment closing ranks to protect their paedophiles? on this day, it is reported that high court judges have decided that paedophiles also have human rights and should be protected. Sir John Thomas, one of the judges, effectively ruled that paedophiles deserved respect for their privacy and family lives and should be able seek to prevent the implementation of Sarah’s Law. Ignore the question of whether such people, having destroyed the Human rights of innumerable people, deserve to be accorded such rights. This is a “stifling act”; an attempt to persuade those who have yet to come forward that it would be pointless to do so. We don’t need an offender’s register, we need a Judiciary that doesn’t consider offender’s human right to privacy to be comparable to the right of children to be physically abused and traumatised for life. Anyone got tabulated info on our politicians, it’d be nice to call up all those with banking connections etc. I’d like to compile a database on our MP’s (They seem determined to create loads of them on us plebs). Previous employment experience (if any) , Employer’s and their business’s. Directorships and any other outside calls on their time with remuneration if applicable. Problem is that this will be time consuming and, in some cases, difficult…For instance I have already noticed that for most politician’s, their degree level’s, unless they are first’s, are omitted. If anybody knows of anywhere such information is already tabulated, it’d save me a lot of time and trouble and I’d make it available to all and sundry, via wiki. A short while ago, at the behest of ‘Unlock Democracy;, I wrote to my MP about Lobbying. As you know, I did write to the Cabinet Office regarding the proposed introduction of a statutory register of lobbyists and the recent public consultation and I now enclose, for your information, a copy of the reply that I have received. I appreciate and share your concern about this important issue and agree that there needs to be urgent reform of the lobbying system to make it more transparent, accountable and appropriately regulated. It is clear that the lobbying system in this country lacks transparency and that if we are to regain public trust in the political system this needs to be addressed urgently. The previous Government had plans to introduce a statutory register of lobbyists back in March 2010 and, given the lobbying controversies that have been brought to light over the last year, I am very disappointed that the current Government have not taken decisive action on this issue and did not include a lobbying Bill in the May 2012 Queen’s Speech. Indeed, while the current Government have repeatedly promised to reform lobbying and have held a public consultation they are yet to bring forward workable, effective proposals. I am also aware that the House of Commons Political and Constitutional Reform Committee have recently published a report that criticised the Government’s draft proposals for having a narrow focus’ that will do little to improve transparency about lobbying’. The Committee therefore recommended that Government scrap their proposals. I share your concern about the Government’s lack of decisive action on this important issue and I would like the Government to bring forward legislation immediately to reform and clean up lobbying. I can assure you that I will continue to press the Government on this important issue. Thank you for your letter of 3 September to Minister Harper setting out the concerns of your constituents about the Cabinet Office’s decision not to recognise submissions received as part of the Unlock Democracy campaign to the consultation “Introducing a Statutory Register of Lobbyists” as separate substantive responses. I have now taken over responsibility for Political and Constitutional Reform. The Government’s Code of Practice on Consultation makes clear that in the analysis of responses the focus must be on evidence brought forward in support of arguments made. It is therefore normal practice to summarise overarching themes rather than identify each respondent, particularly in cases where responses are received as part of, or affiliated to, a large campaign. Nevertheless, I would hope that the vast majority of respondents that replied through Unlock Democracy would recognise that their views have been represented in the Government’s summary of responses, even if they have not been personally attributed to them. The number of people who participated in the Unlock Democracy Campaign was made clear. I can also assure you that these views have been presented clearly both to me and my predecessor, Minister Harper, and will form part of our considerations as we finalise the Government’s preferred approach. -I-am grateful to-Unlock Democracy for the efforts they have gone to in engaging their supporters in this process and I know that Minister Harper was very pleased to have been able to take part in the Open Up Lobbying event that Unlock Democracy organised in Birmingham. I look forward to continuing to work with them. Your constituents can be assured that I share their determination to increase the level of transparency that is applied to the lobbying industry. Thank you for your full and detailed responses to my inquiry on lobbying. I noticed your phrase “if we are to regain public trust in the political system” and felt a need to comment in view of the latest (legal) deceit of MP’s exploiting the renting of each other’s properties. I was particularly disappointed to see that the Express had named Andy Burnham as being involved; especially after his good standing in respect of Hillsborough and the privatisation of the NHS. This particular privatisation policy stinking of corruption with one corp of doctor’s having been outed over their shareholding’s in Virgin Health and the condemnation of that company in their running of certain Health Trusts. It is to be expected that Lansley and co. will have vested interests, it would be harsh if Labour MP’s were also involved. With so many tales of vested interests emanating from Whitehall, coupled with some of the reports on your predecessor, I’m afraid that, such as yourself and Lisa Nandy, face an uphill struggle in any attempt “to regain public trust in the political system”, particularly with the present Cabinet calling the shots. I expect to see a lot more of Sajid Arvid. He ticks all the boxes for the Tories. His first statement (on BBC coverage of a day of action ) prior to criticising trade union action was that his dad was a bus driver. He immediately estabilished that he was from plebian roots. His skin colour (cafe au lait with extra lait) seems to show African ancestry but is light enough not give older Tories the Heebie-Jeebies. His name sounds vaguely Muslim. He’s a slaphead, so may even appeal to most BNP members. These and other factors listed on Wikipaedia proclaim him a non-toff. But, then again, he fits the profile of a Tory politician. Although his degree isn’t an Oxon Hons.in PPE, it is an Hons degree (level not stated so, possibly, a 2:2) in Economics and Politics, so he can talk the talk. Best from the Tory point of view is that he has contacts with the money men, being a former banker (Chase Manhattan Bank and Deutsche Bank). Definitely better than putting up a smirking Chancellor to talk down to the plebs. I found tonight’s (18/10/2012) episode of Horizon confusing. It seemed to consist of two parts. The first part seemed to be just another climatologist propaganda piece and immediately got my hackles up. BBC Horizon stop using Scientists as a synonym for Climatologists. Scientists don’t use bogeyman (semantically loaded) terms to prejudice discussion. “weather weirding” doesn’t explain anything, it just provides a buzzword for those who don’t like to rely on logic. Scientist’s don’t use labels or descriptions of events, as if they were explanation’s. Scientist’s justify comparison’s between effects by explaining how the cause’s can also be related. Scientist’s don’t try to give credence to dubious hypotheses by jumbling their own in among a mass of unrelated but verifiable cases. The program slowly slipped into the second part with the phrase “they’re still trying to understand what causes this effect”. Having effectively stated that climatologists (they’d dropped speaking for all scientists and were now using the oxymoron “Climate scientists”) couldn’t actually justify their claims, the program switched to a realistic approach. Instead of the people of Rotterdam building wind turbines in the hope that the miniscule change in Carbon Dioxide levels would prevent the ice caps melting, they adopted the more pragmatic view of building holding tanks to store flood water for later gradual release. Despite allowing some plank to falsely claim that we had had a stable climate for one thousand years, the finishing theme was if climatologists were correct in their prediction let’s do what Canute did, rather than what his courtier’s pestered him to do. #NHS a crabby old man. I’m a Crabby old man not yet in his dotage, not yet stripped of my property to pay for the care, which I was promised by successive Governments, during my working life. As such, the following chain e-mail struck a chord. What do you see nurses? . . .. .. . What do you see? Who seems not to notice . .. . . . the things that you do. Dreaming that soon now . .. . . . a lover he’ll meet. Again, we know children . . .. . . My loved one and me. I’m now an old man . … . . . and nature is cruel. I think of the years, all too few . . . .. . gone too fast. Not a crabby old man .. . . Look closer . . . see ME!! without looking at the young soul within. You are currently browsing the Wiganshale's Blog blog archives for October, 2012.